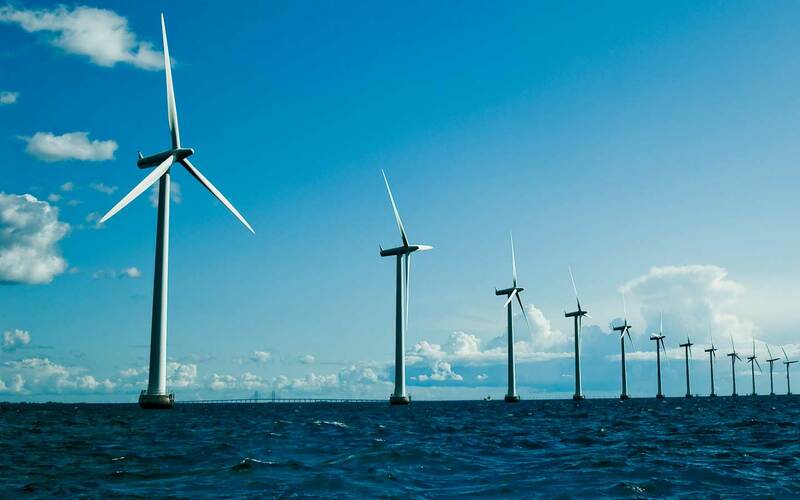 The North Sea has recently become the staging post for a huge boom in offshore wind farms, resulting in the involvement of several offshore wind projects for the SAL team. 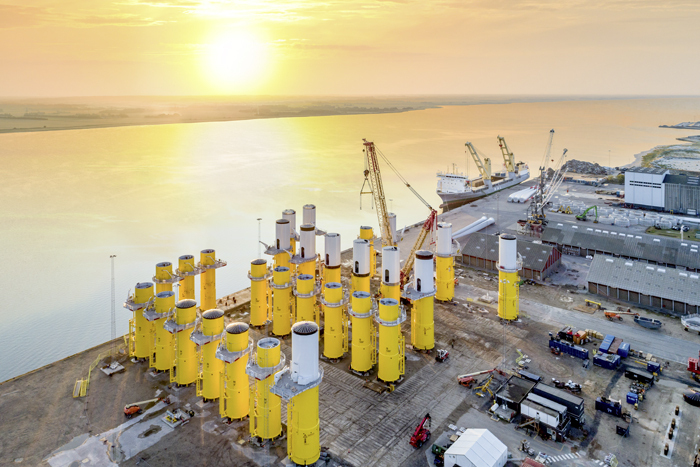 Tying in with the on­going Hornsea Project One offshore wind farm, GeoSea NV awarded SAL the transportation of 49 transition pieces (TPs) for the Horns Rev 3 offshore wind farm. 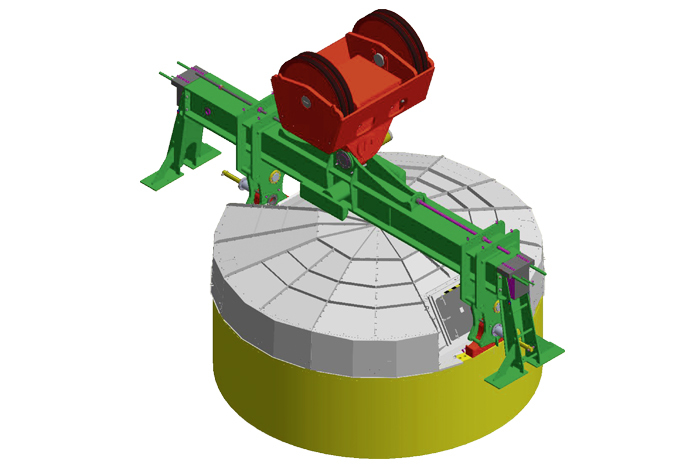 Within a very short time frame from kick-off until the start of the project, our team of experts at SAL not only prepared a full HSSE and Quality plan, and created the technical design, but also finalized the engineering work. 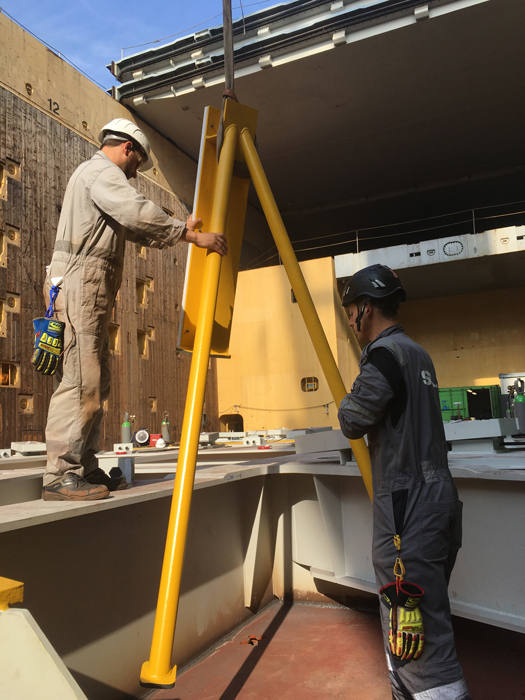 The execution of procurement had to be managed intensively, including professional budget control, and the fabrication of five TP grillages and one lifting tool were also necessary to get MV Lone ready in time to load the first units. 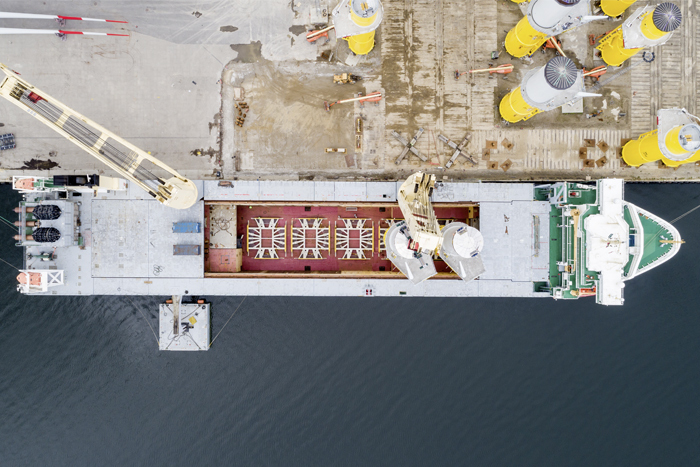 Close attention to detail and risk in both planning and execution ensured consistent progress and avoided delays – meeting both our client’s and our own milestones on time. Our project management team succeeded in developing and maintaining a well-structured communication plan with continuous reporting to the client and various sub-contractors. 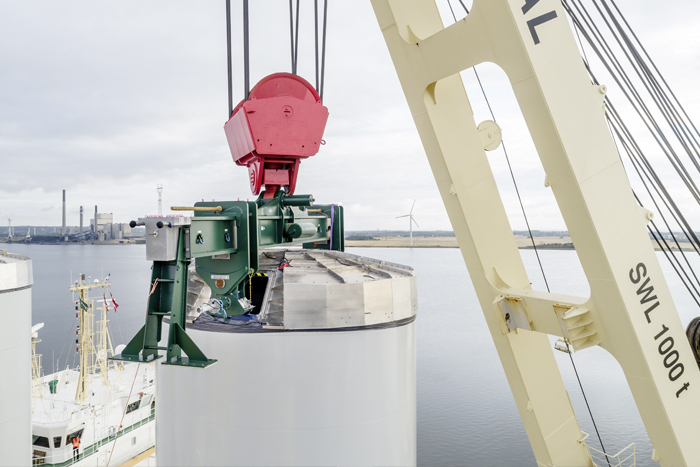 Each of the 49 TP’s measures 32.27 metres in height, has a dimension of 7.12 metres and has a unit weight of 530 tons. Due to the exceptional height of the TP’s and their pre-installed roof top a very low rigging height was necessary to ensure a safe and efficient lift with a sufficient lifting height. 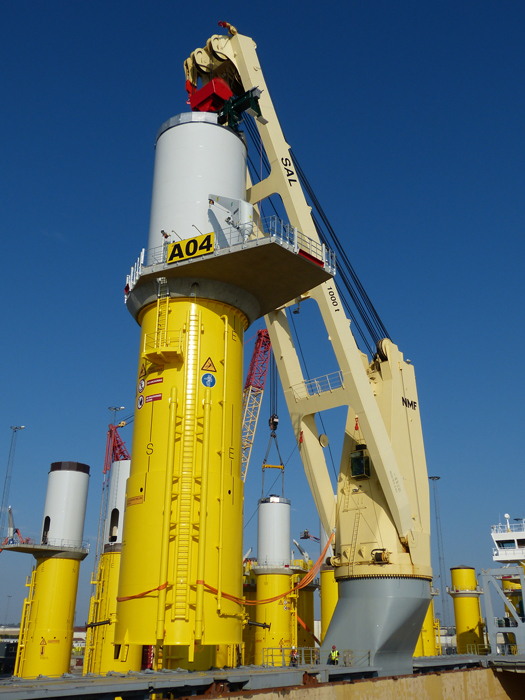 For this reason a tailor-made TP lifting tool had to be designed to replace the usual crane hook. 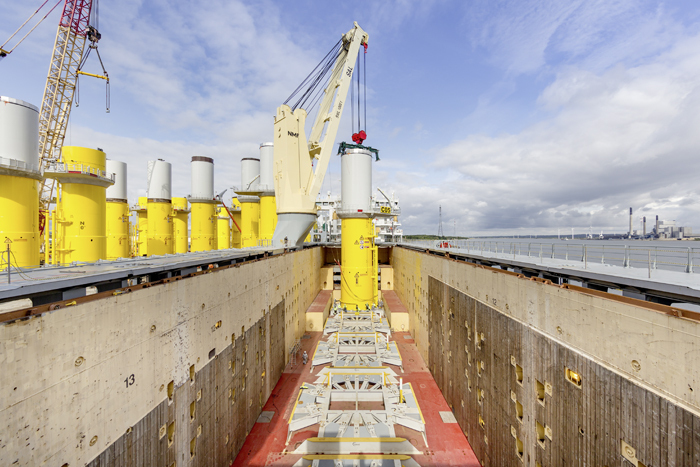 All TP’s were transported using a tailor-made seafastening grillage and clamping system. “We are very satisfied with the realization of the project by SAL. 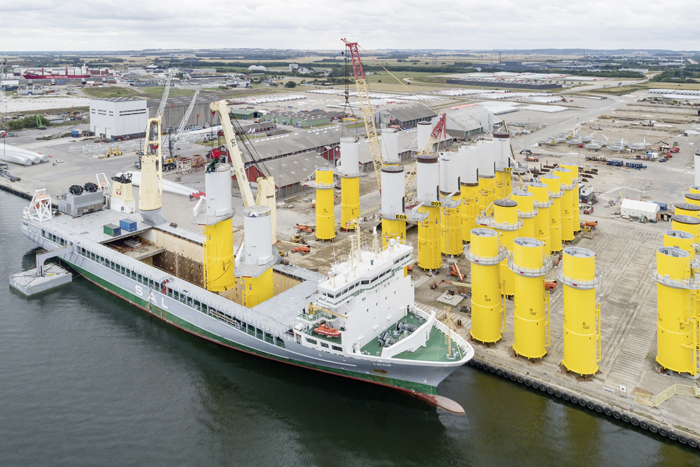 It again underlines their knowledge and expertise in the technical heavy lift transport market for complex offshore wind projects. 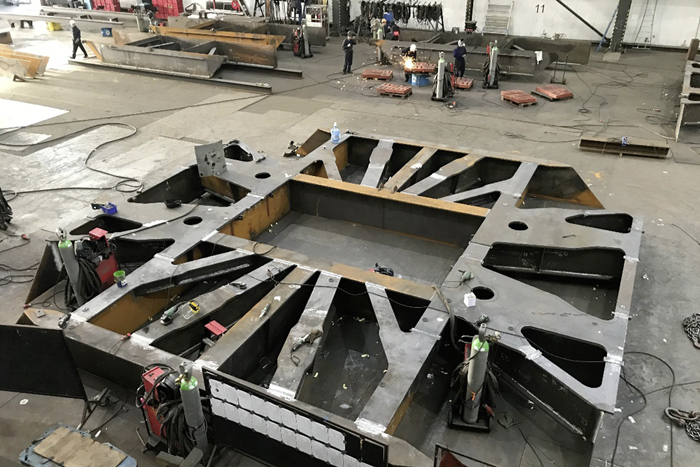 Thanks to SAL’s extensive project management, all necessary structures were designed, calculated, approved, manufactured, load tested, certified, coated and delivered in time to guarantee a timely mobilization and delivery of the project vessel”, says Andrei Lupan, Logistics Manager at GeoSea. 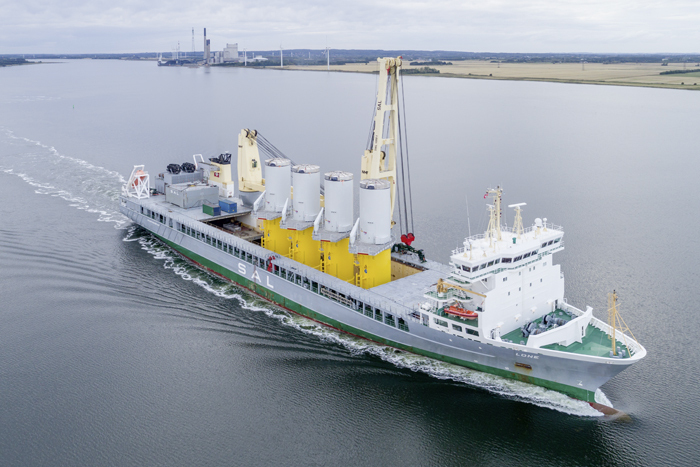 Due to SAL’s well-known flexibility on spontaneous changes and the pro-active approach to assist our client wherever possible, MV Lone was delivered in time to our client and successfully performed in the Horns Rev 3 project.